Exclusively for Warranty Administration Program subscribers. What if I want a real person to help me with the login area? We can do that! For assistance, call 1.800.852.6298. How do I get access to the member login area? If you subscribe to the Warranty Administration Program, or are a member of the Warranty Administrators Club of Mid-Michigan, you are already have access. Your username and password can be found on the inside left panel of your Warranty Administration Program binder. If you do not have the username and password or are having trouble, simply call 1.800.852.6298 ext 132 for help. Note: the username is not case sensitive, so you can use either uppercase or lowercase. The password however is case sensitive. You MUST type it in exactly how it looks on the label or it won't work. Once you log in for the first time, you can change your password to something easier to remember. You can change your password anytime you want, and will be given the opportunity automatically when you login for the first time. Your username however is permanent, and cannot be changed. Can I share my username and password with others in my dealership? Yes, but only within the building. You may not share with sister stores, violators will result in termination of online account. Can I share my username and password with other dealerships? No. You pay good money for all of the benefits, why would you give it away? And besides, violations will result in termination of your online account. By signing in here you agree not to share your login information with anyone outside of your immediate dealership/office/company. jlwarranty reserves the right to make any changes to this policy due to abuse, and to restrict access to anyone we deem deserving. jlwarranty promises to keep your information safe. We will not, under any circumstances, share any information about you, at all, with anyone. We may mail/email out periodic information to you that is related to your membership, but only with your permission, which you can subscribed/unsubscribe from at any time. Anyone found to have violated this agreement will be banned for an indefinite period. If you feel you have been banned unjustly, you may appeal by emailing jlwarranty@jlwarranty.com. 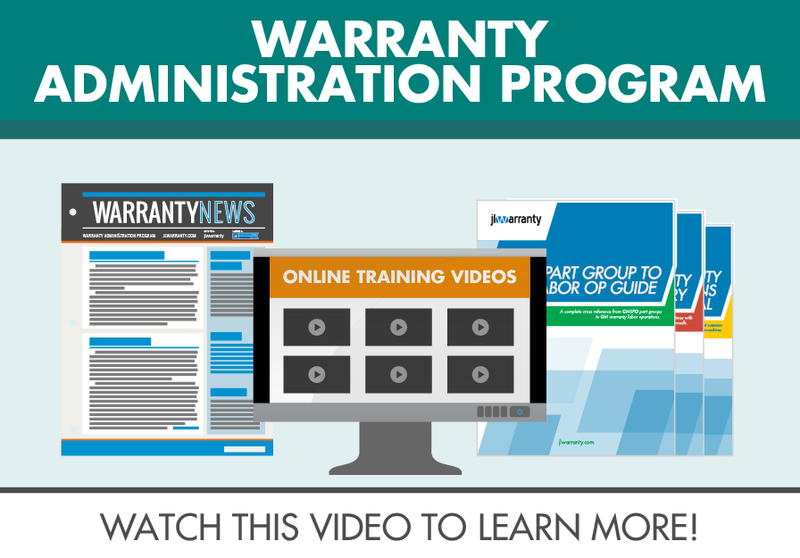 The Warranty Administration Program is a subscription-based, educational program developed by jlwarranty and offered through GM Dealer Equipment. The program educates service personnel to properly claim, collect, and keep every warranty dollar, according to GM Service Policies & Procedures. Stay up-to-date on pressing warranty topics, interact with other warranty professionals, enjoy complete access to the online video training library, and have all the tools and support you need for warranty administration success. Benefits include a monthly newsletter, quick reference publications, online forums, video training, and more.